Martha and I look forward to this day each week when we get to come and visit YOU and see your lovely tea cups! Yea! 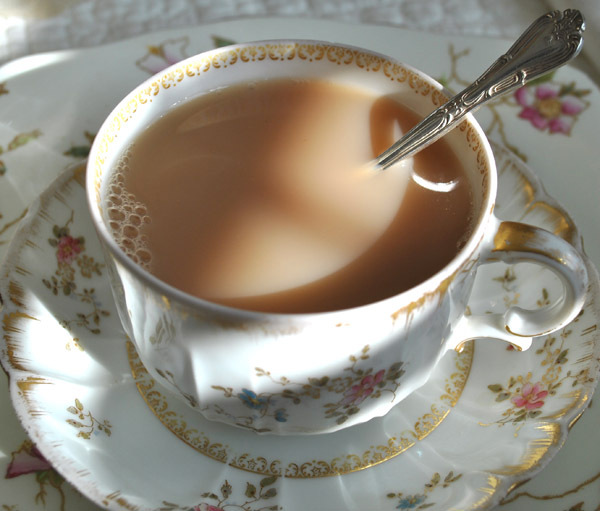 I am sure some people must think me a little off my biscuit when they hear I co host a day of tea cup peeping! The thought came to me that they are beautiful. And I LOVE to focus on beauty! I have known for many years now that beauty and delight are healing for me. The more I focus on the beauty of each day, the more I enjoy my life. Setting up a pretty tray with my choice of lovely tea cup, plate, tea pot and pretty spoons is pure delight for me! These moments of beauty are precious to me. Anyone else out there feel this way? This delicate beauty is new to me, I found it in an antique store on sale for $5. It has two chips, one on the rim of the cup and one on the edge of the plate. It has plenty of tell-tale wearing of the gold trim. This tells me that the cup was well used and well loved. Tea in this cup is so delightful. The cup itself is so light and fine, it makes the tea taste even better! I do not care that it has chips. But I would be delighted to find a match that does not. The flowers are vibrant and outlined in raised gold. The photo does not truly capture it's beauty. This beautiful and delicate cup is made by David Haviland. I was surprised to find out that he was an American. I did not know that. He took his family to France in 1841 to begin his own porcelain factory after seeing some of the fine china that came from the Limoges region. This region is one of the few in the world that has naturally occurring Kaolin clay, which is essential to white eggshell like china. The handle is a simple loop with a spur in the exact perfect spot for my middle finger to balance the cup! It is a very comfortable cup to drink from. 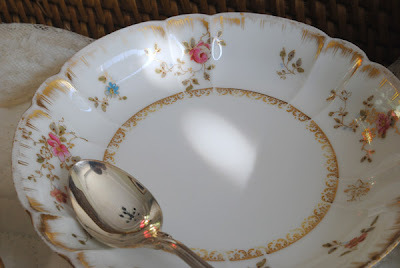 Here is a link to a fascinating history of the D Haviland China Co. The red stamp has been added over the glaze. I spent quite some time trying to find historical records for E. B. Taylor's import company. I only found bits and pieces, one being an advertisement in the Times Dispatch in Richmond VA showing a sale....china that was $1 for only 50 cents. The year was 1908. I did find some evidence that there may still be E. B. Taylor stores or a store but no record of the company itself. 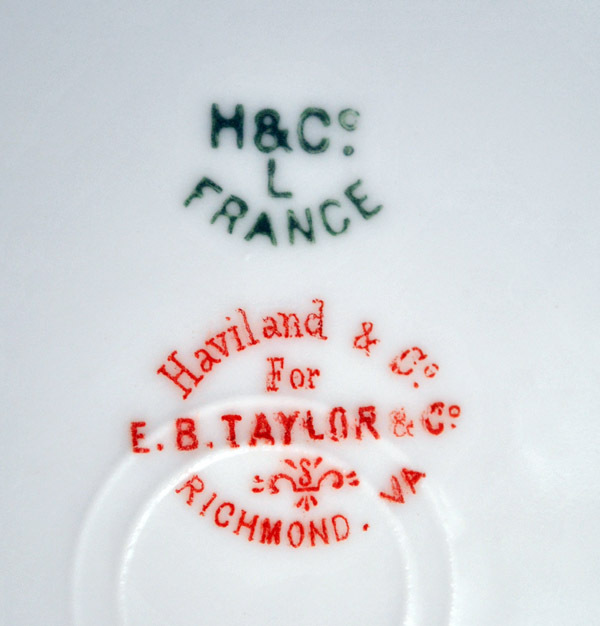 The Haviland backstamp appears to be from around 1885 to 1900, but I am not sure. Charles's company did not survive the stock market crash in 1929. Especially with raw organic sugar. If you would like to play along this week just sign up with Mr. Linky below and make sure you test the link when it shows up that it actually goes to your post. Please also make sure that you have a tea cup to share with us in your post, or a story about a tea cup, or a poem about a tea cup, as this is all about tea cups. Yea! Lovely Limoges! I LOVE teacup Tuesdays...love to look at all the lovely teacups while I have a cuppa! I've seen on tv something about Limoges, very interestiong! The way they make it, it is a real "savoir faire". I Love this beautiful teacup you show us today! I love reading this kind of history lesson, and it left me with many questions about David Haviland. In some ways your post reads as a mystery, wouldn't it be wonderful if someone could fill in the missing information? 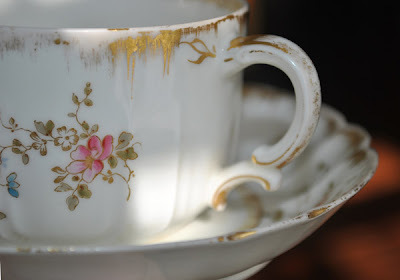 I have found I love some of my teacups that seem the most used, and maybe they are in the condition they are because someone else loved them too. You are so right about beauty and delight being healing. They perk up our spirits and give us a desire to partake of life, and the desire to partake of life inspires hope...hope , the prompter of healing, the motivation behind all things seeming possible. What a delightfully pretty set...I love the delicate flower design...Truly a little piece of much love art. I love this cup! It is beautiful. chips wouldn't have stopped me from buying it. Too cute. What a magnificent history of Haviland. I have much but didn't know he was originally from America. I'll have to go check out the link. Thanks for hosting. That is a lovely antique cup with an interesting history. 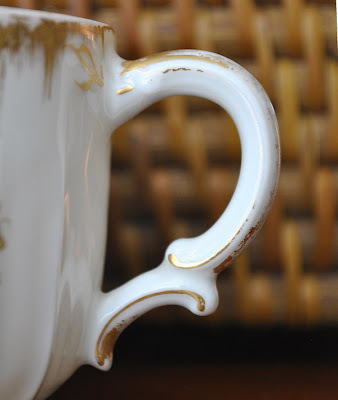 I like to learn about teacups and today you enlightened me on what that little crook in the handle is - a spur. Also, thanks for the link for Haviland China info. Every week I learn a lot reading your posts about your cups and the different companies and stamps,all that is very interesting for me ,you are an excellent teacher! Lovely teacup - a great find. I love Teacup Tuesdays and being able to peek at teacup from around the world; that I probably would never see otherwise. Happy Tuesday, Terri! Your teacup is very lovely...Like yourself, I am attracted to teacups for the same reason...their shapes and colors, and the intricacies of the beautiful floral paintings on them. This particular cup is very attractive. The delicate florals and colors are definitely my cup of tea (pun intended). I have never seen such adoring use in the cup before as in the gold edging, smeared and worn from use. Terri! What a beautiful post! I so love this one..and adore the pretty dainty colors as well! Me too..I love creating moment of beauty..a simple setting of beauty or photo lifts the heart doesn't it! I agree! Gorgeous photos..the last shot is awesome! Have a most magical day and a beautiful tea! perhaps you've already seen my post on BEAUTY? hoping to see the FHC button for your participation in the TeacCup Trade :)) many THX! Your tea cup is beautiful, Terri, even with the tiny chips. I would have bought it too. Very pretty. Thanks for sharing the history a bit too. Always so interesting. 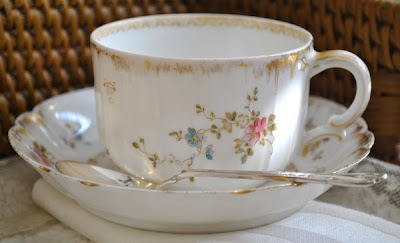 This is just delightful!~ What lovely Limoges Terri!.., Thanks for sharing yet another, 'Teacup Tuesday', with all of us! I love your tea cup and saucer and the story behind it. Isn't it fun to have something special to enjoy? My granddaughters have all claimed one of my various tea cups for themselves. They didn't really appreciate drinking out of their great-grandmother's tea cups! I had to laugh when you said that folks thought you were off your biscuit for hosting a tea party for peeps because I have gotten those same looks! It's funny! I love your little teacup! It is just darling and I so enjoyed reading all the history on the Haviland company. Thank you for sharing yet another delightful teacup! Hi Terri, You have such pretty teacups and I always enjoy my visits to Artful Affirmations! I really enjoyed seeing this cup and thanks for the history. Hi Terri! What a delightful cup! Very, very pretty. Thanks SO MUCH for visiting my blog, commenting, and FOLLOWING! I was so excited to see your sweet smiling face in my Followers box. Great to have you. Come by often. This is a very pretty, delicate teacup. Thanks for sharing the Haviland history. Terri - love your cup. I really love they way the gold wears off with loving use. I have my mother's tea pot with the gold on the handle where she held it as she poured her tea. Lovely memories. Hugs, girlfriend, and I hope you find the mate to your delicate tea cup! Hi Terri :) I do love Limoges china, and your teacup is just so sweet ~ I have a few Limoges plates, and also some cups that I just love ~ Happy Tea Tuesday!! What a sweet cup! Love the pretty flowers and the scalloped edge around the saucer. This tea cup is so lovely and delicate. What a great find! another beautiful teacup you have Terri! love it a lot!.. thanks for sharing!.. 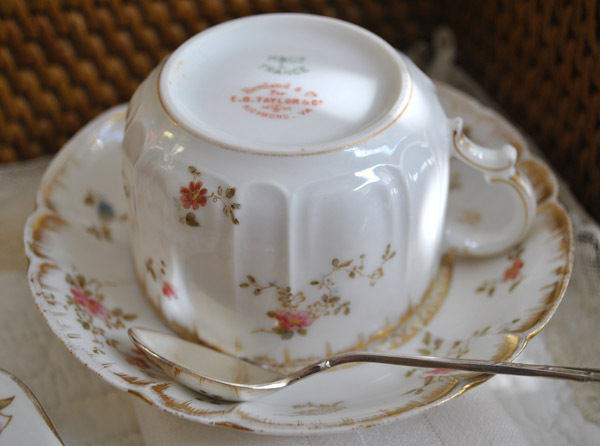 Limoges another fave teacups that any collectors should have! beautiful! Very beautiful tea cup. It looks so delicate! Hi Terri - Thanks for the sweet comments you left me yesterday, really appreciate it. Love your teacup of course, the soft muted colors are very pretty and delicate indeed. I especially love that you shared the history of Haviland's and relationship to Limoges. ME!!! Tea cups are beautiful and they truly make me happy too! :) Thanks for cohosting this fun time Terri. How loved and treasured this wee cup must have been. Love how delicate it is. Limoges makes beautiful china.Thank you for hosting again this week. Thank you for sharing with us @TTTT. As always it was a pleasure. Look forward to seeing you soon. thank you for your sweet welcome and your friendly comment. I am always late with my comments, time is running so fast. Your new teacup is so sweet, a real treasure. I have searched for Haviland once because I have some soup plates but didn't find so much, especially about the import stamp on my plates. I think you have the right feeling for featureing the beauty in the life. This is very important and makes the life much nicer than to look at the bad things, which happens to everybody also. Stick on this positive thinking. Thank you for hosting this fun - we need that all. Each one you share is a true delight. More beauty! and such history, I feel like I am in beautiful Teacup 101 every Tuesday. 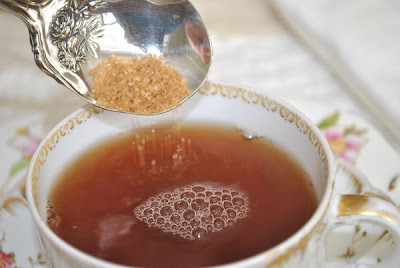 I really love the shot of the sugar falling into the tea...you can see the motion and it's ethereal. So pretty. Thank you for such a beautiful post and gorgeous photos. Hi Terri..just stopping by to wish you a wonderful wkd..and to thank you for all the super lovely comments and visits..they mean alot! thanks so much! Just wanted to say thank you for the lovely message you sent to me Terri ....you are such a sweetheart. I just discovered your blog from Sandy's blog. I spent some time here, reading your posts, and watching your delightful tutorial video on building a Faerie schoolhouse. It is gorgeous and your tutorial is wonderful. I marked your blog to follow. I collect tea cups, so this is a delightful opportunity to share in the near future. Your blog is gorgeous. I love this teacup, oh and the spoon is lovely too. New follower,love all your tea cups. I have sent you an email about a tea set that I just purchased. Oh, I just had the most delightful evening watching part 2,3 & 4 of the faerie school......what fun. Even IF I was not about to be a good student and begin creating one of my own, I think I would watch just because it's so lovely to watch YOU creating. It's like Faerie T.V.! I smiled the whole way through and now I will head to bed and dream of making stand up faeries and little furniture. Thank you, Sweet Pea, for all the time you put in to create this amazing tutorial. Bless your heart.